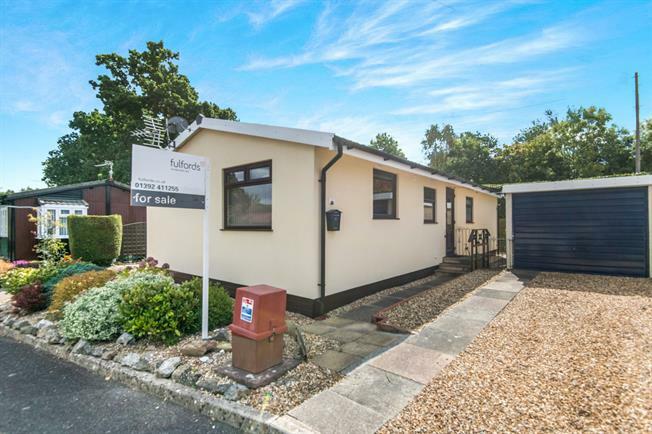 2 Bedroom Detached House For Sale in Exeter for Offers in excess of £140,000. The property is in great condition throughout. It has been fully insulated under the Government Green Deal, new electric radiators, double glazed throughout and comprises of an entrance hall, master bedroom with en-suite bathroom, second double bedroom, modern fitted shower room, kitchen with separate utility area and a living/dining room. Externally the property benefits from a maintenance free exterior, garden shed, garage equipped with power and double driveway. Please call 01392 411255 to arrange a viewing. A range of matching wall a base units with a roll top work surface. Integrated electric oven, four ring ceramic hob, stainless steel sink with drainer and mixer tap over. UPVC double glazed window to the rear aspect, space for tumble dryer, washing machine and larder style fridge freezer. UPVC double glazed door providing access to the rear, wood effect laminate flooring. A white and modern three piece suite comprising low level WC, pedestal hand wash basin and a bath with mixer taps over. UPVC obscure double glazed window to the front aspect, heated towel rail, vinyl flooring, part tiled surround. UPVC double glazed window to the side aspect, wall mounted electric radiator, carpeted flooring, TV aerial point. A modern three piece suite comprising low level WC, pedestal hand wash basin and shower cubicle with electric shower over. UPVC obscure double glazed window to the rear aspect, heated towel rail, vinyl flooring, part tile surround.